Have you ever read about Singles' Day annual biggest online event? Singles' Day in Chinese literally translate as 'bare sticks holiday'. This event widely celebrate by the youth who is proud to be single. WTH! The date November ,11th (11.11) is chosen because it resembles an alone individual. 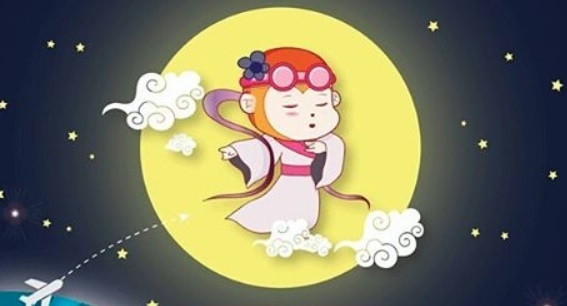 Most single youth will be busy attending party to celebrate this Bachelor's Day and Blind Dates too.The Chinese people take this auspicious date to another level on the online era. This date become one of the largest online shopping Carnival in the world. Alibaba, Tabao and Tmall totally rake a fortune on this date.The seller who took part in this shopping carnival is giving away intensive discount and promotion.WTH! Single people like me who totally over with youth period has no party or blind date to go end up celebrating this single date in front of the PC. My finger will be very busy clicking add to cart and checking out. WTH! 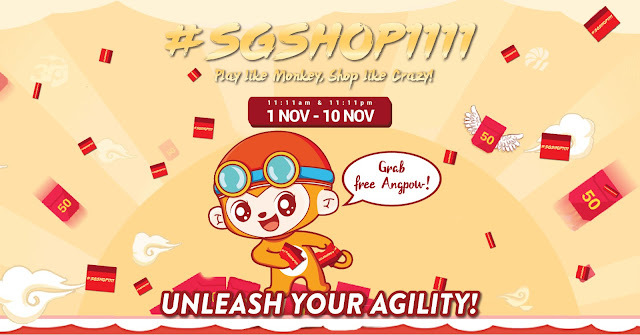 Not missing out this largest online carnival, SGshop plans series of promotion which include publicity, game , discount and rebate. Join me in this #SGshop1111 Online Shopping Fever and Craze starting today 1.11 - 11.11.2016. We start our shopping early since that 11.11 will be super congestion and still able to enjoy up to 90% discount. Here some tactic to avoid congestion during that craze and grab some discount and good bargain. READ CAREFULLY....Who knows you may end up shopping like crazy for FREE. - pre order is entitled 50% discount in service charge in second payment. - The user need to click [ Pre-order button ] while checking out the shopping cart during the Pre-Order period, in order to enjoy the discount during this period. 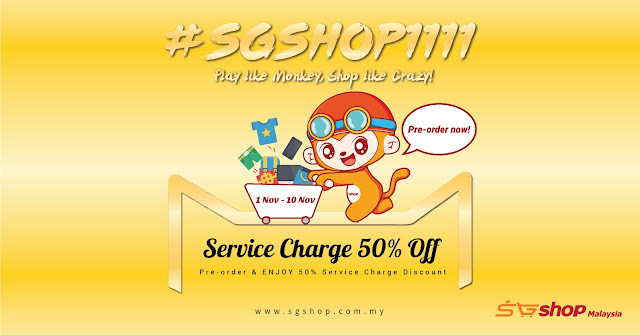 - If the order is normal order instead of #SGShop1111 Pre-order, the order shall not entitled for any discount. * Purchasing department will place order during 11 November 2016. The price difference will be credited back to customers' SGshop balance. - Orders under "Ship-for-me" will not be entitled the discount. - Each order valued over RM300.00 shall be given SGreward RM11.00 as rebate. - Order under " Ship-for-me" is excluded. 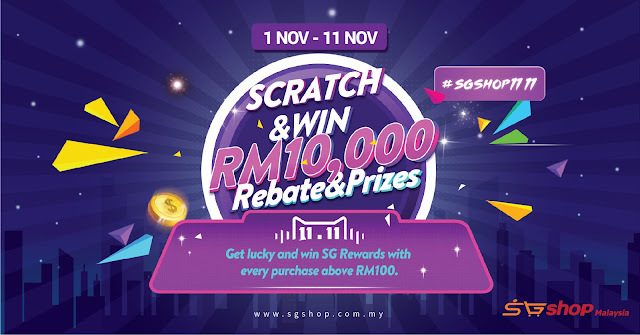 - When each order placed is worth over RM100, the user shall have chance to play [ Scratch to win ]. The total prize is worth up to RM10,000, which include SGreward and mysterious prize. - Only orders under " SmartShop " and "Buy-for-me" are entitled to [ Scratch to win ]. " Ship-for-me" is excluded. - At 11:11AM and 11:11pm everyday within Pre-order period, Ang Pow is available to be grabbed by the customer. - There are total of 11,000 ang pows available. - Each customer shall have 1 attempt to grab ang pow at one time. - Ang pow content includes : [RM20 SGreward], [RM10 SGreward}, [RM5 SGreward], [RM2 SGreward] and [Thank you for your participation]. 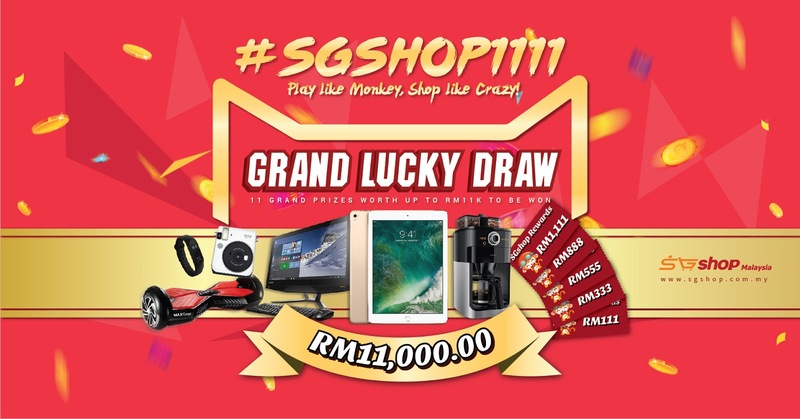 SGshop is giving away 11 prizes worth up to RM11,000! 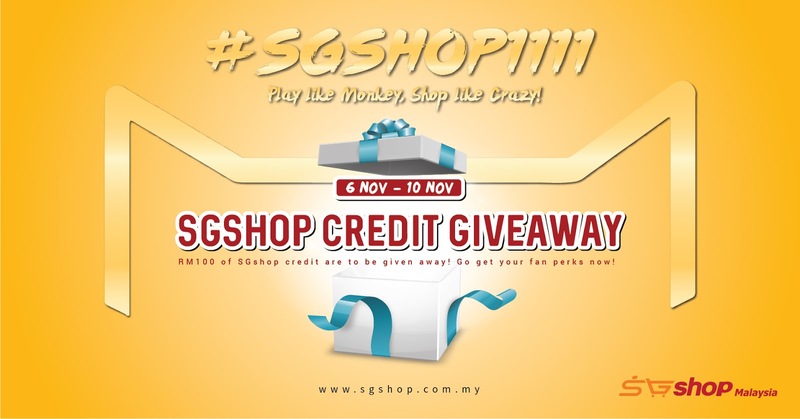 How to win #SGshop1111 awesome prizes? 2. Check out the webpage of #SGshop1111 Online Shopping Fever via SGshop Malaysia website, click "Share to Facebook" button to share this page to Facebook. 3. 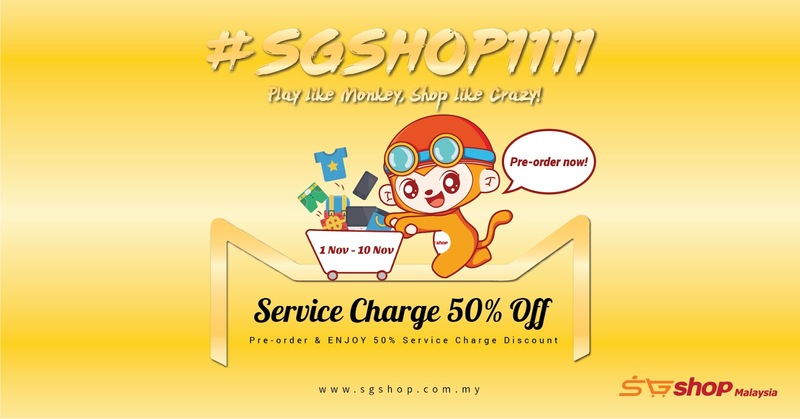 Tag our Facebook page @SGshop Malaysia in shared post. 4. Write the most creative caption to describe '#SGshop1111 Online Shopping Fever' & include hastag #SGshop1111 in the caption / comment. 5. Tell your friends in the caption / comment about which prize you want to win and why you want to win it. 6. Set the post privacy to 'Public'. 7. Tag as many friends as possible in the comment , or share your post to other Facebook Groups. 8. The more Likes + Comments + Shares you have , the higher chance you get to win the prizes. Winner will be announced on 17.11.2016, make you to stay tuned at SGshop Facebook page. Princess Cindyrina Giveaway for the month of November is very special giveaway. 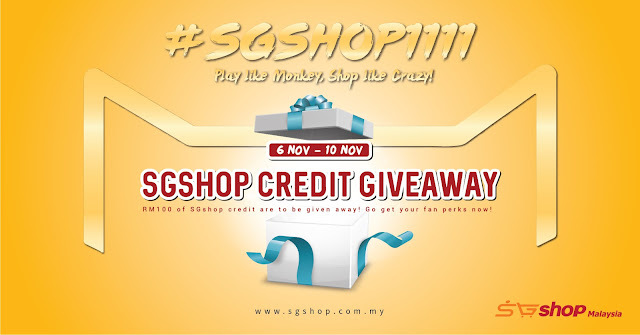 The prize is RM100 online shopping credit sponsored by SGshop Malaysia in conjunction with #SGshop1111 promotion. Step 2 – Like and share this post with hashtags #PrincessCindyrinaGiveaway and #SGshop1111 in your caption “ I want to win SGshopMalaysia shopping credit from Princess Cindyrina because ……. “ and set your post as Public. This Giveaway ends on 9th November 2016 and I will announce the lucky winner on the 10th November 2016. Make sure to register at SGshopMalaysia since I need the your username registered to credit RM100 into your SGshopMalaysia accounts. 1. Giveaway opens to all Malaysia legal residents only. 2. Only participants who fulfill the mentioned requirement will be qualified for this Giveaway. 3. One (1) winner will be choose from the effort and number of shares and likes will be choose randomly. 4. PrincessCindyrina reserves the right to change the Terms and Conditions at anytime. DON'T FORGET TO LEAVE YOUR MESSAGE IN MY COMMENT BOX TO NOTIFY ME YOU HAVE JOIN. I'm really interested to shop this 11.11, not because I'm single but because there are just too many great deals to miss. Already marked my calendar. Thank you for sharing the information. Wow, never heard of this singles day in November. Something new i have learned. Thanks for the info and awesome prizes to be won. I would really go crazy and spend up a lot in the end! haha! thanks for spreading! interesting one. 11.11 is coming soon, can't wait! Yes I like this site, I bought some of my dresses there too. I'm thinking about switching agent already! It's shopping spree :D Can't wait no more for 1111! I want angpau...hahhaha omg so many shopping temptations... T.T my heart and wallet can't take it.. I remember last year during november it was crazy. 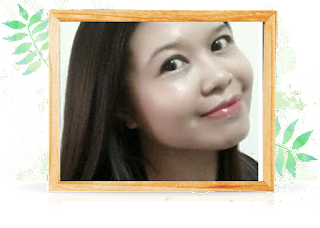 God luck to the winner as Sshopping with SGShop is the best. Hey, this one is very tempting! Online shopping is so convenient and cheaper too. Good luck to the winner as it is fun to shop with SG Shop. very nice! good luck to those joining the giveaway! shop till your heart is content. So many interesting deals! More reasons to shop! Been waiting for this friday! 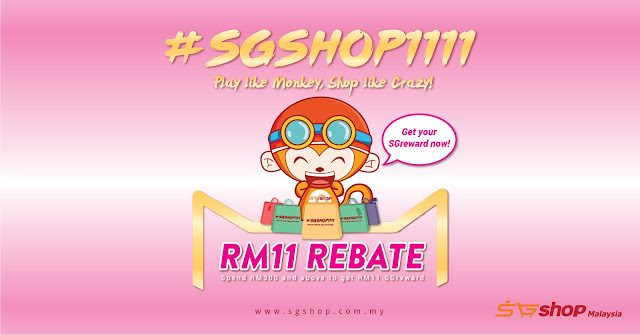 really addicted to shopping with sgshop..got lots of surprise and discount..hope can win! already join..hope can win coz i already addicted to shop again. I had joined this contest, Princess Cindyrina!! Hope I can be the winner. I had joined the giveaway contest. Hope that I can be the winner. Thank you. Joined the contest in Facebook. Thanks.